Is adopting regtech solutions just a nice-to-have, or is it a must for any business to ensure compliance and good practice? How regtech-savvy are you? What are the key drivers for your organisation to adopt regtech solutions? How can regtech benefit your organisation and the industry on the whole, if at all? Build or buy? In-house or outsource? And what’s on your wishlist? We are calling on you to help us create a comprehensive study on the subject – please spare a couple of minutes to fill out this survey. The survey is now closed and the results are available here. Tech consultancy's first investment in an Asian start-up. Infographics: how regtech savvy are you? 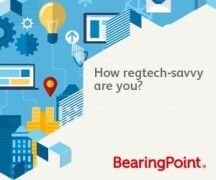 Banking Technology and BearingPoint conducted a survey to find out the industry view on regtech and its implications for all parties involved. The findings are now available in this nifty infographics. BNG Bank, a public sector bank in the Netherlands, is implementing BearingPoint’s Abacus regtech solution for MiFID II/MiFIR, EMIR II, MMSR and SFTR reporting.